Regional transportation planning efforts can impact an individual’s quality of life. In Central Florida, the last decade’s planning efforts have led to a significant amount of transportation investment. Currently, there is $7 billion worth of transportation investment under construction. Twenty-three miles of I-4 are being rebuilt. The region recently completed a 17-mile expansion of commuter rail. The metropolitan area is growing by nearly 1,000 people a week. This growth is leading to a more diverse and potentially more urbanized region. Regional transportation planning needs to consider how to ensure the transportation system can support this growing and changing population in healthy and sustainable ways. MetroPlan Orlando recognized this need and identified FHWA’s INVEST as a tool that could help the agency with its health and sustainability planning objectives. FHWA awarded MetroPlan Orlando funding to assist with its applied research project. The 18-month project had three phases, each with a different focus. The first phase involved using INVEST to evaluate what MetroPlan Orlando was already doing through its planning and organizational efforts. A truly healthy and sustainable environment requires close collaborations by all sectors. Phase Two was the Transportation Think-In: Making 2045 Healthy, Sustainable, and Resilient. It brought together 60 community leaders to discuss how transportation impacts their work. The third and final phase followed up the evaluation and summit with the publication of three white papers. MetroPlan Orlando started its project with three objectives: 1) establish health and sustainability metrics, 2) identify sustainability priorities in regional transportation planning, and 3) foster collaborations between transportation, environmental, and health stakeholders. At the completion of the 18-month applied research process, MetroPlan Orlando successfully met two of these objectives and made significant progress on establishing health and sustainability-related metrics. MetroPlan Orlando evaluated its existing MTP using INVEST Version 1.2. Some of the INVEST criteria pertain to information that is not contained in the MTP. Staff compared other agency processes and work against the relevant INVEST criteria, on a case by case basis. The SPR-09 Travel Demand Management criteria is one of these criteria. SPR-09: Travel Demand Management (13/15): MetroPlan Orlando does not own or operate any transportation facilities, nor does it operate any ongoing programs, such as Travel Demand Management (TDM) and Commuter Services programs. However, it is the regional forum for discussing TDM issues and works closely with the region’s TDM program, rethink Your Commute, which is funded by the Florida Department of Transportation and operated by a consultant. TDM-related performance measures are included in the MTP and continual monitoring is done on these indicators. Additionally, TDM staff present to MetroPlan Orlando committees and the MPO staff collaborates with TDM staff on several projects. The two most recent examples are the addition of a TransitScreen in MetroPlan Orlando’s lobby and research into transit-oriented development and commuter rail ridership. SPR-14: Transportation Systems Management and Operations (13/15): MetroPlan Orlando is known around the country for its TSMO efforts. The INVEST evaluation reinforced this. The evaluation did not yield a perfect score. At the time of the evaluation, not all TSMO strategies identified in the MTP were being implemented. Since completing the evaluation, the MPO has adopted an ITS Master Plan and programmed all remaining strategies for implementation. MetroPlan Orlando has a TSMO Advisory Committee and policy to allocate 20% of STP funds to TSMO projects, which enabled the high INVEST score. SPR-05: Access and Affordability (4/15): The Access and Affordability criteria asks for details about whether or not existing documents incorporate equity or identify how planning documents will address issues for specific population groups. 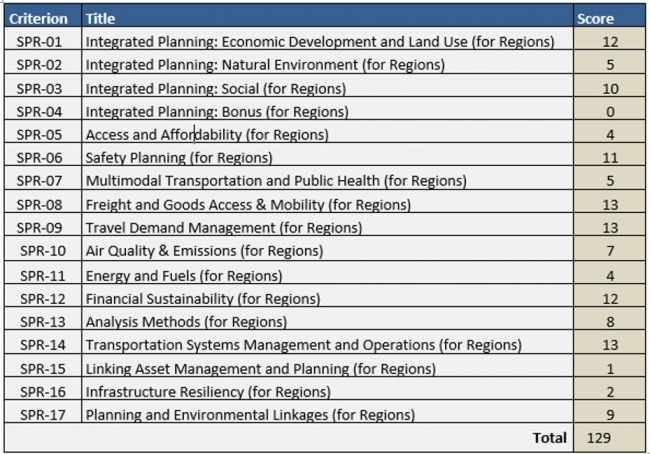 While MTP received points for broad community outreach efforts, the existing MTP did not include analysis that connected these efforts to projects in the cost feasible list. SPR-07: Multimodal Transportation and Public Health (for Regions) (5/15): MetroPlan Orlando has engaged in significant health-related activities in recent years, but unfortunately, none of these are included in the MTP. We do not prioritize projects based on objective criteria nor have a monitoring system for doing so. The siloed nature of planning by mode was revealed during this criterion. SPR-16: Infrastructure Resiliency (2/15): Planning for Resiliency is now a requirement for MTPs and MetroPlan Orlando’s MTP does not include resiliency at all. The two points it received in this criterion relates to coordinating with partner agencies. The evaluation enabled MetroPlan Orlando to identify content for its summit (Phase 2). It was clear that the agency engages with its transportation partners often, but little to no engagement occurs with community partners. These are the partners who are more likely to be affected by Access/Affordability, Public Health, and Resiliency issues. In February 2018, MetroPlan Orlando hosted its first ever Transportation Think-In: Making 2045 Healthy, Sustainable, and Resilient. Sixty community leaders from non-transportation attended and provided valuable insights. These insights led to several research topics: Planning in an Era of Uncertainty, Funding, Housing and Transportation, Access to Services Perception of Transportation, and Collaborative and Institutional Roles. Housing: A primer for transportation professionals in Central Florida: Housing and transportation are often a person’s two biggest expenses, yet these sectors usually conduct their work independently. This report discusses how transportation and housing work together now, and transportation’s role in Central Florida’s current housing issues. Tran$formation: Funding healthy and sustainable transportation options: Transportation funding is inherently complex. This report is a plain-language guide for how we fund transportation today and ways we can fund it tomorrow. Framing the Future: Preparing MetroPlan Orlando to enhance Central Florida’s quality of life: Healthy communities require collaborative institutions. This report analyzes how MetroPlan Orlando can help improve quality of life in Central Florida. The INVEST evaluation informed Phase 2 and 3 of MetroPlan Orlando’s INVEST project. The Think-In spurred conversations and activities related to nearly every INVEST criteria (SPR-13 and SPR-15 were not discussed). The White Papers gave more data analysis and guidance for the agency moving forward. A number of the recommendations referenced MetroPlan Orlando’s upcoming strategic planning process. This process is about to begin and offers the region an excellent opportunity to act on the recommendations. The forthcoming Strategic Plan will guide the rest of MetroPlan Orlando’s work – the next MTP update and any other planning or partnership activities it undertakes. Once the next Strategic Plan and MTP are adopted (no later than December 2020), MetroPlan Orlando plans to evaluate its new plans using the INVEST guide. This before-and-after evaluation will enable MetroPlan Orlando to analyze any improvements in its INVEST score, as well as understand what worked well and what did not.